Welcome to the 2016 Valentine’s Day Blog Hop! Danielle from Creatively Homespun brought together 20 super talented ladies and together we created something amazing! This blog hop is a roundup of some fantastic and inspiring Valentine’s Day creations. Everyone created something special to share with you, so be sure to browse thru all 20 links! You don’t want to miss a thing! One of the things I wanted to work on this year was spreading joy to friends and family. Whether it’s making dinner for someone when they are sick or mailing a card with a note just because; my goal is to bring a smile to as many loved ones faces as possible. I’m taking full advantage of Valentine’s Day to do just that! Valentines don’t just have to be for the kids. Thanks to the Dollar Spot at Target I have found a TON of fun gifts I’m giving to friends this year with cute little tags. I’ll be sharing more of these with you this week and next but today I want to share my favorite gift that I easily made in to two with a second trip to Target (because who can say no when your husband asks if you want to run to Target with him?!) These Valentines will be perfect for your girlfriends, teens, or even for your kids to give to their teachers. 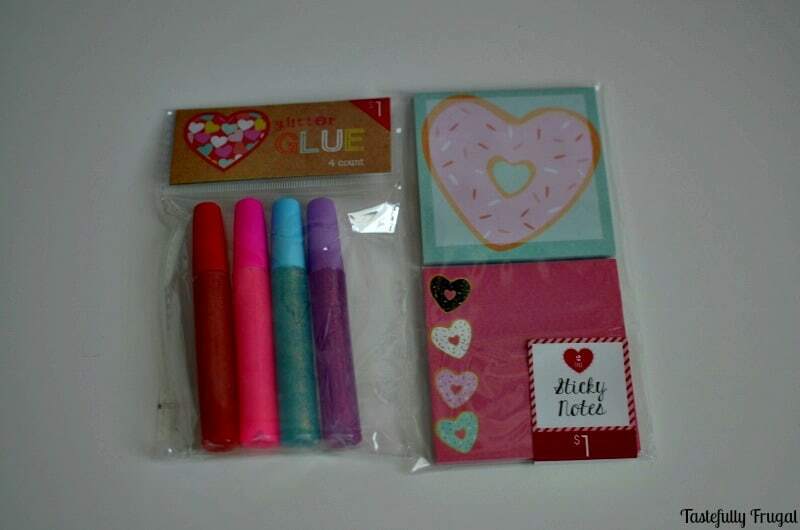 All you need is either sticky notes or glitter glue (I got the 4 pack of glitter glue and the 2 pack of Valentine sticky notes from Target) and gift tags, also bought at Target but you can make your own with paper and bakers twine. A girl can never have too many sticky notes or too much glitter glue! 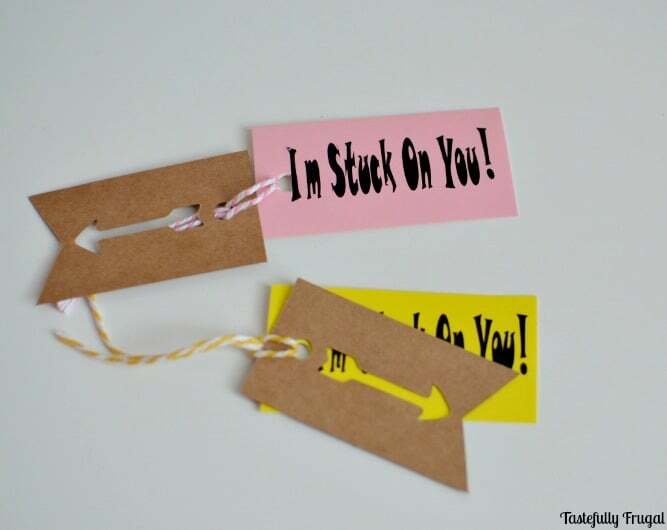 You can either write “I’m Stuck On You” on the tags or use a vinyl cutter (I love my Cameo) to cut the sayings out of vinyl and stick them to the tags. For less than $5 you can buy enough supplies to hand out these gifts to 10 or more friends and help spread a little joy to the ones you love. Are you handing out Valentines to girlfriends and/or making special Valentines for your coworkers or kids’ teachers? I’d love to hear what you’re making. And don’t forget to check out the other Valentine ideas my lovely friends created! 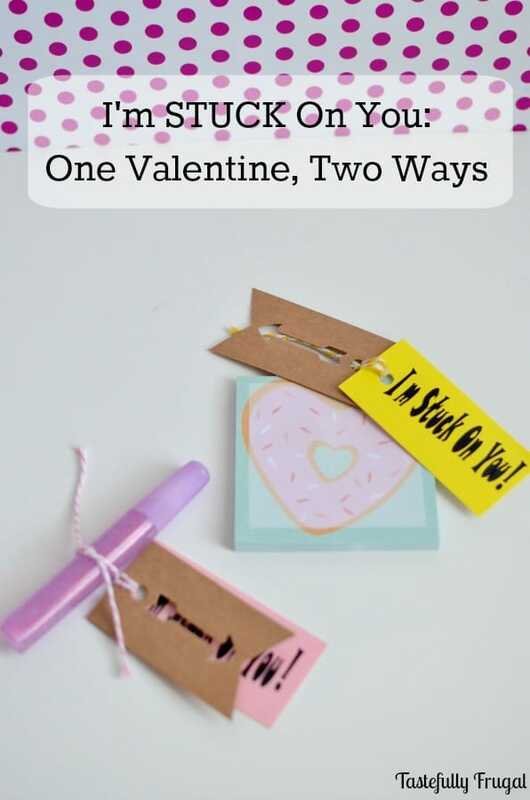 What a cute idea, handing Valentines out to friends! Target dollar spot is THE place to be for sure! Great projects, so fun to hop with you! This is a really cute idea, Sydney! I really love your idea for spreading joy to others too. Hope you have a great week! So adorable! I’m so glad I was able to participate in this fun blog hop with you! Have a great day! Great idea! The Target dollar spot is such a fun place to shop! I think Valentine’s for friends might actually be more fun than planning the ones for my kids! Sydney – your Valentines are so cute! We have Dollar Spot love too! We all need a little more “joy” in our lives! These are super cute valentine’s. Thanks for the ideas and it would be so fun to get one of these and well as giving them out. My little girl would love to give these fun Valentine’s to her classmates! Thanks so much for the inspiration! I love the dollar spot! But I hate that our nearest Target is 45 minutes away!! 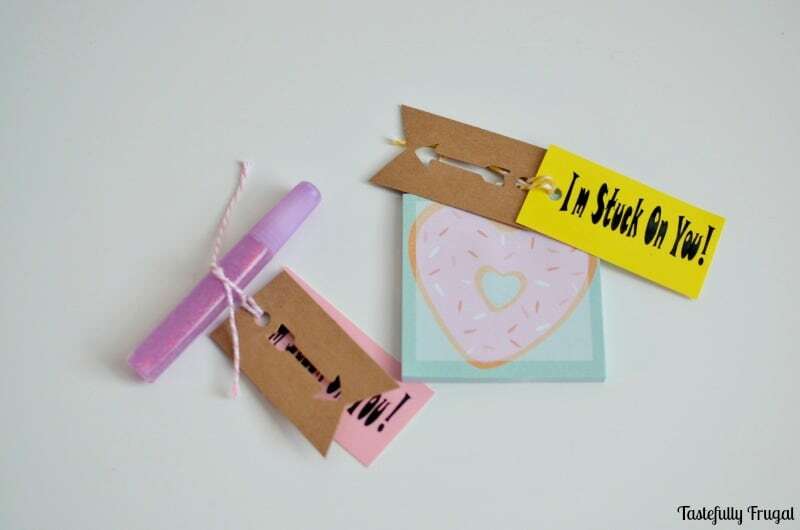 It would be worth the drive to get the supplies to make these adorable Valentines though!